The media feeding frenzy that greeted the release of the final tranche of British UFO files was a fitting end to my involvement in one of the most successful Freedom of Information projects in recent years. #UFO files began trending on Twitter early on Friday 21 June as blanket coverage of the files release was rolled out first in UK media including BBC News, ITV, Channel Four, Five News, Sky News, Al-Jazeera and later in the USA (with stories featured on NBC News and in the Washington Post, New York Times and Huffington Post). In total the Ministry of Defence have now released 209 files and approximately 52,000 pages of information on UFOs and related mysteries. This sobering fact leaves those still calling on governments to make full disclosure about their knowledge of the alien presence on Earth looking increasingly sidelined. Of course, conspiracy theorists will continue to dismiss the real ‘disclosure’ as a whitewash because its contents do not support their preconceived beliefs. And their suspicions will be encouraged by those who make a living from UFOs such as Nick Pope and Tim Good, the latter interviewed by Sky News here, because it is in their interest to keep the mystery alive and kicking. Pope is on record as saying there should be “full disclosure” of all information on UFO matters held by governments across the world. Yet he has gone to extraordinary lengths to ensure that MoD papers relating to him remain permanently hidden from the public on the grounds of “privacy”. A judgement published by the Information Commissioner in 2010 revealed that Pope had written to MoD asking them to with-hold these papers permanently. How ironic that after 52,000 documents have been disclosed the only files now being permanently with-held are those written by his superiors at the Ministry of Defence. The reason these papers are being with-held is because they contain information about Nick Pope’s “conversion” to UFO believer that followed his alien abduction experience in Florida in 1991. This happened shortly before he joined the ‘UFO desk’ when he claims he had little or no interest in the subject. More recently, Bob Sheaffer’s Bad UFOs blog reveals how Nick Pope has been paid by computer games companies to promote stories about secret government plans to thwart alien invasions. Despite this conflict of interest he shamelessly continues to make spurious claims about aliens posing a threat to earth’s defences and hints darkly that ‘…much of the best material has not been released’ by his former employers. Unable to debate rationally and facing the loss of both status and credibility, he has decided the best tactic is to portray me as a “useful idiot” who is parroting the MoD line on UFOs as having no defence significance. He fails to appreciate the delicious irony that this is the very same line that he himself articulated whilst employed by the MoD. Is he a ‘useful idiot’ too, or just an idiot? Anyone who has followed my Freedom of Information Campaign to persuade the British government to release their entire archive of UFO material will know how far from the truth this caricature actually is. In reality, from 2000 onwards my FOI campaign made me a thorn in the side of the MoD to the extent that after seven years of constant pressure they relented and decided to transfer all surviving UFO papers to The National Archives. But instead of hailing the disclosure as a breakthrough, conspiracy nuts have portrayed it as a cover-up because the documents do not provide any support for their beliefs. ‘The truth‘ sought by those who believe in flying saucers is hidden in plain sight in the testimony and beliefs embedded within the files themselves. Interviewed by journalists from around the world during the past seven days, it became obvious to me that the arguments I have been making about UFOs as a modern myth – a social and cultural phenomenon – were slowly being taken on board, as if something had clicked into place. Jasper Copping, writing in the Daily Telegraph, wryly noted that, ‘in the end it was not the aliens that overwhelmed the “UFO desk” but a rather more mundane tormenter – Chinese lanterns.’. The idea of UFOs as signifying more about our our beliefs and anxieties as human beings rather than providing hard ‘evidence’ of extra-terrestrials also became the subject of questions put to me by Justin Webb on BBC Radio 4 Today programme. And the link between UFOs and religion came up yet again when I appeared on the BBC’s Politics show with Andrew Neil and former LibDem MP Lembit Opik, who who has now come out as a ‘believer’ in aliens. This entry was posted in Uncategorized and tagged Andrew Neil, bbc news, BBC Radio 4 Today programme, Benjamin Radford, Britain's X-Files, Channel 4, conspiracy theories, Daily Mail, Guardian, ITV, Justin Webb, Lembit Opik, New York Times, Nick Pope, Sky News, The Daily Telegraph, The National Archives, Tim Good, Twitter, UFOs as a modern myth, Washington Post. Bookmark the permalink. While we all understand your desire to claim total victory and now empty government file cabinets, please return to reality. The believers and the conspiracy types will always believe, no amount of evidence will ever change that, it is a belief, as much as any other, no one has ever met God, but a billion believe He exists. All governments of the world could release every piece of paper, document, computer file and photo they posses about every topic they store information on, from the beginning of their archives, and if there is not one piece of hard-core evidence, the believers will still not be shaken from their fantasy or belief, in fact, in many cases it will strengthen their belief, it would confirm that the conspiracy is worldwide, so something must be going on. Really it’s a win win for the believers, no evidence means there is a cover-up. the logical thought, that there is no evidence, is bypassed. I used to believe when I was young, but I got my brain working for myself, rather than just believe what other people were saying, for a good many years I saw UFOs as a kind of belief system, with the fall in the popularity of religion in Christian countries, I don’t think it surprising they look beyond God to the stars for a reason why we are here, to explain the great mystery. I think we also see it in mass sport and entertainment events, religion being supplanted by ‘belief’ and meaning in your favourite football club or band or something. I also think that many of the phenomena we experience, from UFOs to Demons, are the same things folks have always seen, heard and felt, but our culture and our exposure to much more information these days, gives our brains a different ‘pattern matching’ database for psychological processes like pareidolia. I get sleep paralysis every now and then, used to scare the crap out of me, I thought someone /something was holding me down in bed and trying to get into my chest. I used to sleep with the light on, so scary was the feeling, not that it changed things much. I had no real belief system, so my sleep paralysis was just a scary mystery, after a while I researched and concluded it was sleep paralysis. Now I can understand someone who believed in evil aliens or demons believing that ET or Azazel were the guilty party. I think the thing is most believers in alien piloted UFOs are butthurt, they been bitching about disclosure for decades, they finally get it, and because the results aren’t to their liking, they won’t accept the evidence. It is funny, they often say we wouldn’t believe in their explanation unless a flying saucer landed on the White House lawn, yet this seems to be the level of evidence they want from the government’s UFO files!! I would really love for there to be aliens visiting this rock, it would be world changing, to have the ‘Are we alone?’ question answered, to have my belief, as a young kid, in this stuff confirmed, I just see no evidence. To support Dave here. Whatever the critics say of him, he has done a great service to the UFO community by pressurising the MoD into releasing these files and then ably coaxing this important disclosure into the public domain. Those files are out there for anyone to read and to study for themselves because of these actions and anyone perceiving that act as a cover up is living in cuckoo land in my opinion. I have been involved in collating UFO investigations for 40 years, both regionally in north west England and, for 13 years, as director of investigations with the British UFO Research Association. The cases we studied closely mirror those in the MoD files – though we had the time, remit and inclination to follow the more interesting ones through when the MoD (perfectly reasonably) did not. What we found, and have stated over the decades that we have found, matches what the MoD report. There ARE some UFOs (around 5% of reported cases) – in the sense that they are not readily resolved by investigation. But there is no substantive or well documented hard evidence that these unsolved cases reflect either a threat to our defence or alien craft. They do, in my view, offer evidence of several intriguing things on the fringes of scientific knowledge in fields such as atmospheric physics and the nature of consciousness. They are, unarguably, worthy of study and NOT a simple consequence of drunken percipients on route from the pub. But equally the MoD was never – and is not now – the correct body to collate such data and spend precious resources on a subject that really needs to be demystified and placed into the realms of scientific study. We will learn things from UFOs that way. We may even do useful things with these findings, such as harness better power sources and energy resources. We could save lives, as some of these UFOs (or UAP as we should correctly be calling them) appear to be a potential threat to our ever increasing air traffic. Such progress will be made more likely by the releasing of this data for further study and by us seizing back the initiative for UFO investigation from the hands of those who were never willing volunteers nor suitable participants. UFOs have always been wrongly presumed to be synonymous with alien spaceships. Waking up to the realisation that they are no such thing and are, instead, something possibly less profound but certainly no less fascinating, is great news if you really want to search for the truth. As for Dave being some kind of pawn used by a conspiracy to hide the truth, I have known him since he was a young, enthusiastic student of this field. His interest is real and he has done the hard miles in the field, developed his ideas appropriately through many investigations. He means what he says and says what he means. Both very good things here. I may not agree with everything that he says on the subject – but I do with much of it and respect all of his views about the remainder. I certainly know that he is nobody’s puppet. And I, for one, say thank you for his efforts. Thanks Jenny but the comment about people seeing UFOs after leaving the pub in Glasgow was meant as a joke! Well said, I don’t think I have said thanks to Dr Clarke for his efforts!! There are some who will always believe that UFOs are alien piloted vehicles, that hang on that 5% unexplained, and take that “unexplained” as meaning alien pilots, when it just means we don’t have enough data to make an identification, and that includes the possibility of new phenomena, maybe even a bit of new physics. What ever ‘they’ are, ‘they’ are interesting. As for the MOD, it is what it says on the label, it is concerned with the defence of the realm, and after decades of collating this stuff they have essentially come to the conclusion that there is no defence significance, so decided to spend the money elsewhere on something more productive. I think a lot of the alien piloted UFO community are a little butthurt about the closure, all the time the desk was open, it meant UFOs were real enough for the MOD to investigate, that aliens were invading our airspace, the MOD desk gave some kind of validation to their fringe thinking. Now it has gone, and all they have now is the cover-up and conspiracy card. I wouldn’t believe a single word that Dave Clarke says, he’s a government shill on MI5’s payroll, it’s obvious. Even Nick Pope denies that he has any connection to the MoD – why would he do that? Pope is another shill, trying to disguise Clarke’s real role. All of the MoD files that have been released are fabricated, there’s absolutely no good stuff in them (something else Pope denies, he says that there is good stuff in there if people look for it). And the Queen is a reptilian alien, check out David Icke’s site for absolute proof of that. WAKE UP PEOPLE, THE ALIEN INVASION STARTED CENTURIES AGO!!!!! Great post Zak, made me laugh and smile. To steal a phrase from the X-Files – trust no one, least of all me & The Pope, particularly liked the conspiracy inside the conspiracy in that The Pope is trying to disguise my real role, fantastic! Never mind the Queen, anyone could be a reptilian in disguise, including you! Why would you call out Nick Pope for taking “financial advantage” of the situation by writing books, for example, and then quite fascinatingly, on this very blog in this very week, you advertise your own book for sale on amazon.com? This doesn’t reflect well on your credibility. And a question. Why weren’t the files released over the course of five days, rather than five years? Hi Eric, I’m surprised you cannot see the obvious. Pope is an entertainer who makes his living out of his UFO stories. Therefore Pope isn’t going to kill the goose that lays the golden eggs by telling people there are no UFOs as he would then have to earn a living in the same way the rest of us do. Therefore to suggest that by writing a skeptical book on the UFO Files and advertising it I lose my credibility is nonsense. I don’t make my living out of selling UFO stories, in fact I’ve spent more time and money working on these files than I will ever earn from royalties. I earn an honest living teaching in a day job. There is a difference. Eric: The your question about why the files took five years to release. Quite simply really. There were 209 files and 52,000 pages. Every one of those pages had to be scanned and personal details (people’s names, addresses etc) removed under the Data Protection Act legislation. This takes time tom complete and as it was being done by admin staff at MoD it had to fit in around many other tasks which had high priority. If you were were given this task to complete do you think you could have accomplished it in five days? David, you made the mistake of asking a person with two degrees in physics how long it would take to sanitize 52,000 pages by removing personal information. In order for this to be accomplished, none of the pages need to be comprehended in terms of their content, because nothing in the documents was classified as a threat to the defense of the nation from the very beginning, so each page merely had to be scanned for names, addresses, phone & security numbers. Furthermore, as can be clearly seen from the files, most pages were on standard 8.5 x 11 sized paper with double and sometimes triple space text. A large portion of the pages contained merely drawings and many were cover pages. But even if we ignore this, and instead of making the safe assumption that many pages required no eye scanning time whatsoever, we’ll assume the worst and say all 52,000 needed to be scanned by eye (NOT READ, BUT SCANNED). I can scan an 8.5 x 11 page of double spaced text in 30 seconds, therefore two pages per minute, therefore 120 pages per hour, therefore 960 pages per 8 hr day, therefore 4,800 pages per 5 day work week. Therefore, in less than 11 weeks, I, as a single reviewer, could sanitize the 52,000 pages in less than 3 months. Now lets make more ‘worst case scenario’ assumptions that again, aren’t necessary, but you will complain they as I can easily anticipate knowing (intimately) how you think. Lets assume I am only 50% efficient, meaning it takes me 2 times longer because I choose to surf the Internet 4 hours out of my 8 hour workday. It would then take me about 6 months to sanitize the files. Lets also assume I only work 20 hours per week rather than 40. Then, therefore, it would take me. as a single person, under a year to sanitize the files. However, as we know, many of the pages were merely images that required no scanning time, and more importantly, there were multiple people working on this sanitization, not just one. If we guess there were 4 people with the same “low” efficiency as I have, it would have taken less than 3 months to accomplish this. Yet, the public had to wait 5 years. No Eric the big mistake I made was responding to you in the first place. Quite what having two degrees in physics has got to do with this I don’t know. What I do know is that these documents were scanned and redacted by the Ministry of Defence, so if you have a problem with how quickly this was done I suggest you take it up with them. I would have been more than happy if the release programme had been completed in a few months but although some people appear to believe I run the world’s intelligence agencies in my spare time, unfortunately I have no influence over how central government spends public funds. David, with regard to you claiming you are not making a living off this topic, I would appreciate if you would post the official sales data of your books being sold on Amazon, directly from the report that Amazon gives you on your book sales, at the selling price (roughly 15 pounds?). It will be enlightening to know if you’ve sold 1,000, or 10,000, or 100,000 copies. 1.5 million pounds would certainly be a humble man’s take and we’d forgive you. Eric although the sales of my book are none of your business I was interested to learn that you appear to believe Amazon sends me a report on the latest figures. Perhaps if I had two degrees in physics I would have known that? But having just one degree, in archaeology, I didn’t. However, I’d be interested to know where copies of these reports are being sent as I have never received one and I don’t know of any other author who receives such helpful missives from Amazon either. No wonder they are making such a huge profit (or is that because they don’t pay any tax? Whatever, let’s waste some more time). What I will say is this, I recently calculated how much dosh I had spent on my research at The National Archives since 1998 when I first started travelling from my home in the north of England to Kew near London (one of the most expensive places to stay in the UK as Joe McGonagle who posts here will testify). On average I visited twice per year and spent on average £500 on each visit. Over 15 years that means I spent around £15,000 on my research. In contrast the income from the book I wrote is around one tenth of that figure. So, Eric, if you or anyone else wants to make out that I am making a living out of UFOlogy then please go ahead whilst I carry on passing the hat around the office so I can pay my gas bill. Now I have been frank and honest I have got a question and a challenge for you: You now contact Nick Pope and ask him how much money he makes out of UFOlogy in an average tax year. Ask him how much he was paid for the advances on his books and how much he charges for media appearances and interviews. I bet my bottom dollar he will not reveal anything. Hi Eric, I see that you live virtually next door to Nick Pope, who is currently staying near Tortolino – you could actually ask him yourself about what he manages to scrape out of ufology. I’m pretty sure you can find him. I won’t be back, just because I am too busy and when putting something out there which invites ridicule from the dull and ignorant it is inadvisable to bother with the responses, since they are predictable and merely aggravation. However I want to emphasise the word choice. I said I “know” and that is exactly what I meant. So by all means ridicule something based on your own lack of the same experience and which somehow negates my own experience in whatever weird logical paradigm you inhabit, but do not presume to assume your beliefs outweigh my experience. I think my feeling is probably similar to the fisherman who catches an impossible fish in some water hole only to see it slip overboard before he can secure it. Listening to people deny he ever caught it, stating it is impossible etc, would be about as annoying to the guy, but he can afford to be indulgent, since he at least knows the truth. However those self satisfied customers are the ones who are the fools, and so stupid they don’t even know it. I respect an open mind but consider one closed against others’ witness testimony because of personal beliefs, limited forever avolving scientific understanding and limited experience is about as feeble and undeveloped as primate thinking gets. @rabbitnexus. I have NO doubt that people have extraordinary experiences, always have done always will do. What I doubt is those experiences are caused by aliens. Quite what the beliefs you attribute to me are supposed to be I have no idea because I don’t believe in anything, least of all aliens who by your description sound like religious deities. To suggest that science is a belief system is total nonsense and reveals you don’t understand how science works or what its for. Science has given us everything you rely upon in your everyday life – penicillin to fight infections, electric light to power your home and gadgets, TV and the internet. What have your aliens given us precisely except a lot of headaches?. In fact, I know it’s not from your previous writings. Your efforts are certainly valuable and appreciated by those who recognise the value. The adverse commentors on here are probably the ones who submitted futile FoIAs like “tell me everything about the Aliens”, “release all your information about Roswell”, or “What was the light in the sky I saw on 1st January 1978?” and were disappointed by the obvious responses. It was requests like yours, mine, Gary Anthony’s, Andy Roberts and a tiny number of others which really forced the MoD to release the documents. Requests like those I mention above had zero effect on the MoD. Nick Pope is only out to serve himself, and doesn’t mind whose back he clambers over to do so, or whose efforts he takes and presents as his own. His actual achievements in ufology are so pathetic that he needs to ‘borrow’ other people’s and exaggerate his own. I still don’t understand his current reluctance to discuss his toll-gate experience, he was not so coy in 1995. Maybe he is saving it up for when his ratings slump further, hoping the tale will revitalise his career as an entertainer of the gullible. In the meantime, he seems to be riding on the back of Peniston, Burroughs, et al. I am surprised any of those had time for him, given his track record on veracity, but then again, maybe there is another page in the magic binary, auto-updating notebook which told them to go to him…. Dave, 2-degrees Eric’s scanning ability sounds alien to me. A normal human could not sustain such a rate for 2 hours without getting eye-strain and making mistakes. Even the super-slow MoD made errors in their redaction 9names and addresses left unredacted and unnecessary redactions). You should report 2-degrees Eric to your MI5 handlers, he is clearly super-human if not alien. Joe, I had begun to wonder if some of those who post here are actually human but at least I know you are the real thing! Don’t take the micky out of Eric though because he is a clever lad, he’s got two degrees in physics. Just to comment on Jak’s post saying that all the files released by the MoD are fabricated and so (presumably) the best cases have not been released. Most reports are real. 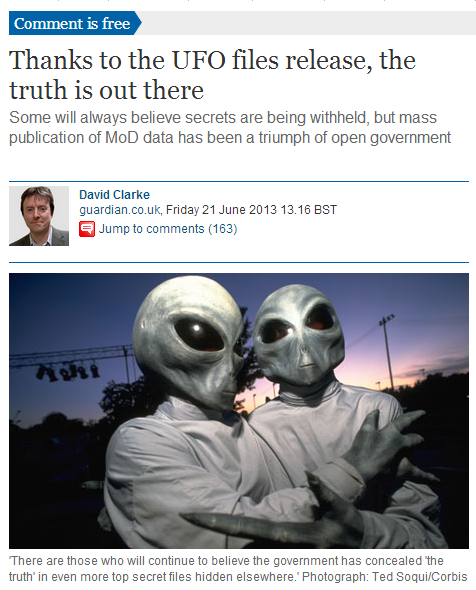 In fact, plenty were reported to UFO groups at the same time as they found their way to the MoD. Even alleged alien contact cases are in the files if you look for them. I have met several of these witnesses. And some of the reports are from real people that you can track down and interview and that prove to be genuinely interesting. Like every collection of UFO data ever compiled – from Project Blue Book to the MoD, or from scientists like Allen Hynek and Jacques Vallee, or UFO groups like MUFON in the US and BUFORA in the UK, these 52,000 pages fit one pattern. The vast majority are lights in the sky. Most are reasonably easily resolved. But a few become much more interesting when you dig into them. However, substantive evidence that these cases reveal a globally obscured alien contact is not staring from these MoD files – just as it is not doing so from all the other data sets from the past 70 years. So surely you have to ask yourselves why this is so. And the most likely explanation is not some massive conspiracy that presumably requires silencing increasingly fractionalised regimes from all over the world where no MoD edict against disclosure would hold sway. So it has to be a credible possibility that our widespread presumption that UFOs must be alien craft is an error – perhaps driven by wish fulfilment amidst a lonely planet understandably seeking evidence that other life forms are out there and interested in us. Of course, such beings quite possibly are out there. But the UFO evidence in total – not merely these MoD files – fails to demonstrate direct relevance to this search for extra-terrestrial intelligence. So it is wholly reasonable to follow ‘other lines of enquiry’ seeking potentially different causes for the unresolved cases. They are full of clues and useful data suggesting which way to turn. And, in my opinion, just arguing that UFOs are not an alien contact is a completely different from saying that UFOs are not real experiences or lack scientific interest. For me the files demonstrate implicitly that some cases are both of these things. As a result the first step in trying to discover what the best UFO cases really are has got to be an acceptance of what they are actually not. Being realistic is not to be complicit in debunking. It is just what all serious UFO researchers have to be if we are to stop going round in circles and find answers that have sufficient hard evidence to persuade the majority of the world to stop laughing and start listening. The burden of evidence lies with us and pleading cover up and conspiracy to defend our cause takes us away from – not towards – progress. Well said Jenny. You’re absolutely right. Most of the people banging on about conspiracies and whitewashes haven’t even troubled themselves to look at the files they are talking about. You clearly have. The fact that the stories in the files can be cross-referenced with sighting reports made to civilian groups like BUFORA destroys the ludicrous allegation that the contents are ‘fabricated’ (how insulting this is to the people who filed these reports in the first place). What the UFO conspiracy crowd cannot accept is that the files are the reality of UFO reporting. There are no ‘good’ cases of unknown craft tracked on radar, chased by jet as imagined by the likes of Nick Pope in the files not because they have been squirreled away somewhere else, because they are so few and far between. If we go looking for those cases we have to go back to the late 1950s. I can’t think of a single one in the UK during last 20 years that has stood up to critical scrutiny and that pretty much says all that needs to be said. The one common denominator in ALL these reports is the human being telling the story or recounting the memory. We don’t have any aliens or bits of spacecraft to examine, therefore speculation about ETs is singularly pointless in the study of UFOs. What we do have is the witness, their testimony and the context in which that was recorded. Therefore it is obvious that the answer to the UFO mystery lies not out there, but down here. As I keep saying it is a socio-cultural phenomenon. Dr David Clarke, you make too much sense to be taken seriously, you obviously haven’t been abducted and probed. I see the phenomena just like the historic occurrences of mass hysteria, whole villages ‘dancing to their deaths’ or burning some poor old anti-social village crone as a witch. Thing is, back then the ‘lunacy’ was trapped by the lack of communication, get past a few days walk and the ‘craze’ has died or never believed or heard of. But, in the modern age we have higher literacy and better communication methods, someone reports an alien encounter in Sydney and seconds later in the UK our own conspiracy types are off to the supermarket stocking up on Red-Bull, beer, ciggies and crisps, ready for the coming invasion. I believe that as communications got better and the world ‘shrunk’ more folks are exposed to these type of things, so when maybe a 100 years-ago when old Burt said: “Oi fank Oi saw some little goblin…a comin owta ‘aystack…” his story would only ever be heard by his fellow peons…and the tale cannot reach ‘critical mass’, and dies. Now, though, if even a tenth of a percent of the world’s 7 billion people are gullible/susceptible to believing such tales we have 7 million people who; “Can’t all be wrong”, and the tale survives. Communication today is amazing, the loneliest guy on the planet can still feel they belong to something, a forum somewhere or Lusty Linda’s Entertainment Services, and such a medium is perfect for people who are poor critical thinkers who will believe anything anyone tells them, especially if it suits their beliefs.